Imagine that you are standing in front of a giant earth pyramid with gaping holes in it that look like windows and doors to a nether world. Now pan your head from left to right and see yourself surrounded by these tall pillars and cones that seemed to have mushroomed everywhere around you. The holes in them look larger as they open into a world which was once homes and hiding places, churches and caves where monks once lived. 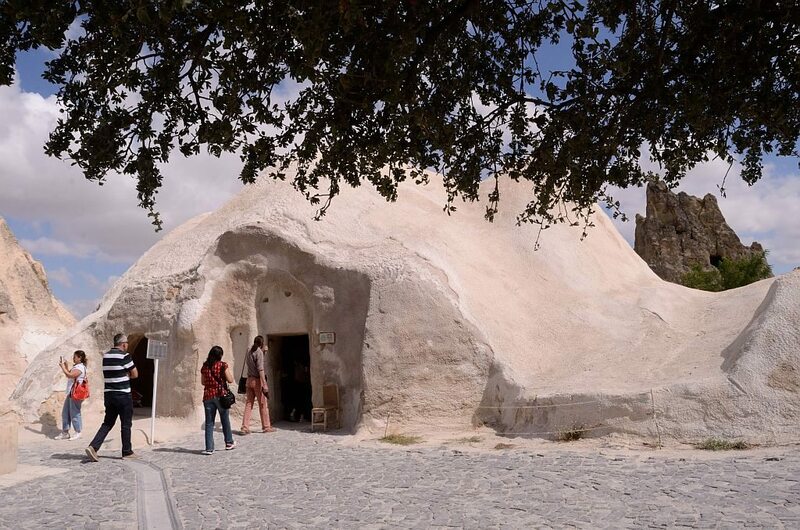 I am in Goreme in Cappadocia and this is what they call an open air museum. In Cappadocia, I realize words have a meaning of their own. Fairy chimneys are for instance are not made made but are chiselled and shaped by nature to look like mushrooms or camels or whatever you imagine them to be. 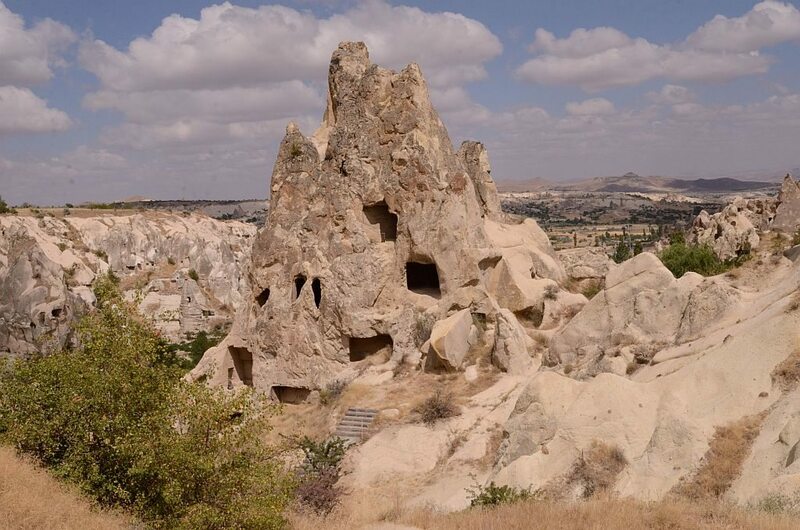 Here men lived and built underground cities or created homes and churches in these rock spires at a height of 40 feet or more. Their troglodyte homes are set in a tableau of yawning valleys which are not green but pink or ochre creating a lunar landscape. 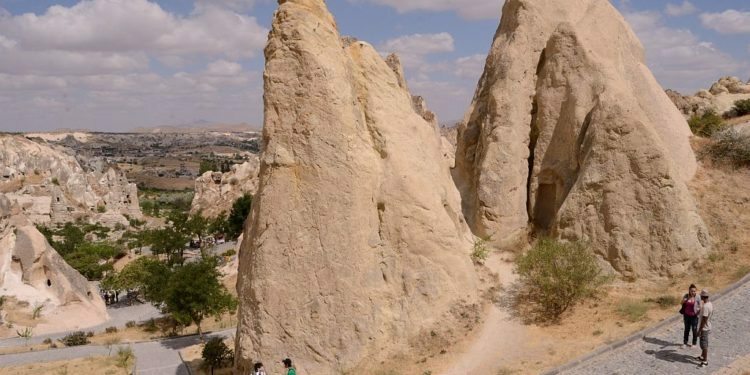 Goreme is one of the tourist destinations in Cappadocia where you find hotels and shops carved inside these fairy chimneys that take you back to the days of yore when they were once dwellings of people . Here an entire city used to be built underground while troglodyte villages were inhabited as early as 4th century. And in the open air museum, rock hewn pinnacles, some of them with knobbled peaks tower around me. Mounds and hillocks are everywhere while the dark chambers carved inside them lead you to mysterious worlds. Scaling up to 100 feet, these hoodoos are magical shapes, that rise from the ground and give a surreal touch to the landscape. The Goreme Open Air Museum is a World UNESCO site and it actually refers to a vast monastic complex with eleven churches, carved in these rocks filled with some of the most beautiful frescos of the Byzantine period. 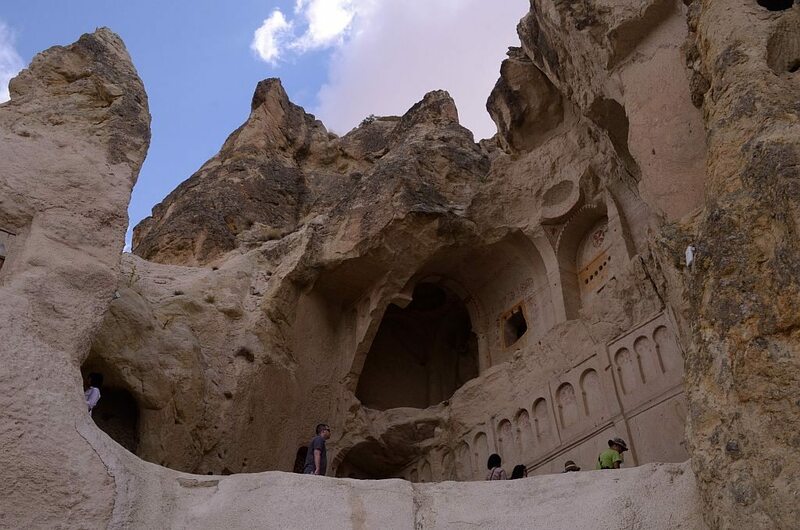 Dated between the 10th-12th centuries , these cave chapels were sites of religious refuge of monks who had settled here and they were probably the artists as well or had worked with them. The names of these churches tickle my curiosity and the stories around them are fascinating. We stop at the Apple Church also referred to as Elmali Kilise which I thought had a mythical connection to the Biblical story of Adam and Eve. However I learnt that it was a red orb in the hand of Archangel Michael that one can see in the dome of the apse gave its name. My guide however says that it could also refer to an apple orchard that grew close by. Built around the 11th century one can see carved into four pillars the sign of a Greek cross . Amidst other paintings, you can see the Last Supper . 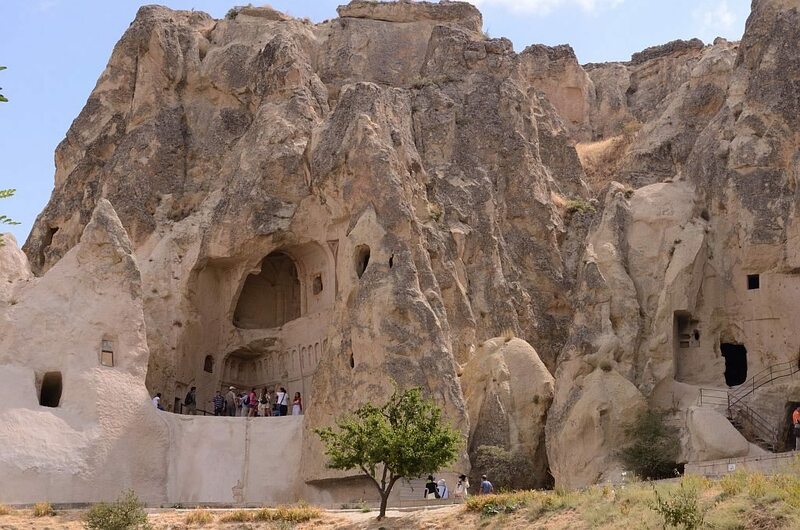 Goreme had been a Christian sanctuary where monks dwelled and even hid during persecution. The churches here have highly figurative paintings drawn from the life of Christ and stories from Bible. The Barbara church is right behind the Apple Church and it is called the Azize Barbara Kilisesi . A church dedicated to the Egyptian martyr who was killed by her own father . Among other frescos in this 11th century church, you can see on the dome a depiction of Christ on the Throne. We visit the Snakes Church or Yılanlı Kilise to see a fresco that depicts the killing of the Snake by St George and St Theodore, while opposite the entrance is a painting of Christ with a book in hand. At the Çarıklı Kilise or the Church with Sandals, one can see two footprints below the Ascension fresco, painted right at the entrance . However the most spectacular of all churches is the Dark Church or Karanlık Kilise which takes you inside through a narrow tunnel. There are paintings everywhere, on the walls, on the dome depicting scenes from the New Testament, Nativity, Last Supper, Betrayal of Judas, Crucifixion among others. My guide tells me that after the Turks invaded the region, it became a pigeon house and it was restored rather recently after cleaning out all the pigeon droppings. As we leave, my guide points to the Tokali or Buckle Church that lies a bit outside the museum complex and is the largest church in Goreme. The church has four chambers, the old church built in 10th century, the New Church added in the next century, the Paracclesion and the Lower Church. The church also has a crypt underneath the nave. Stunning paintings in rich indigo decorate the walls of the four main chambers , depicting in detail in vivid hues the Life of Christ and the twelve apostles. Outside is a nunnery which rises up to the six storeys high, although tourists are not allowed beyond the second storey. As we hop inside the van, a truck carrying a hot air balloon whizzes past us. I wonder what is most spectacular – the fairy chimneys carved by nature due to erosions or the homes and churches built in these rocky pyramids painted with such dazzling frescos. 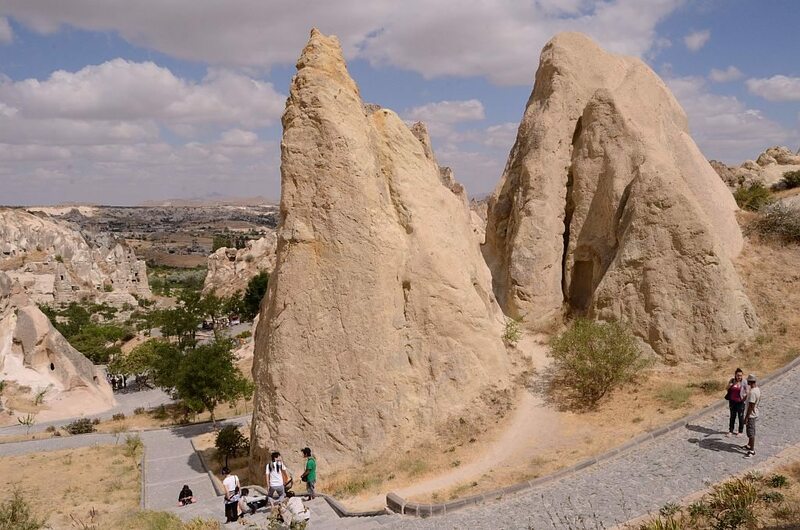 Cappadocia is one of the famous tourist destinations in Turkey and it can be easily accessed from Istanbul by air. One needs at least three days to see some of the best sights in the region. Turkish Airlines connects directly to Istanbul from India. Contest time – Whats your reason to visit Turkey ?